Offering you an interesting and unassuming way to keep some items always on hand when you are sitting outside enjoying the sun, or even as a way to keep things that little bit more tidy and organised, The Suncast Deck Box Storage offers a fun and great looking extra storage space. Designed to fit in with any kind of garden this storage cube will be more than happy to keep your belongings safe from the rain for a number of years and always be on hand for you to open its gas assisted lid and grab what you need as the lid slowly goes back down. It has a great wicker basket type of look that really does give it a bit more class and will make it look great with the rest of your garden. The storage cube may have a wicker basket look, but this is made to be able to last years out in the rain. Suncast have used blow moulded resin to give the box the ability to take on anything that the British weather can throw at it. 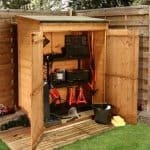 It has a good amount of storage space and it is not too heavy so you can easily move it around the garden to a space where it fits in perfectly. 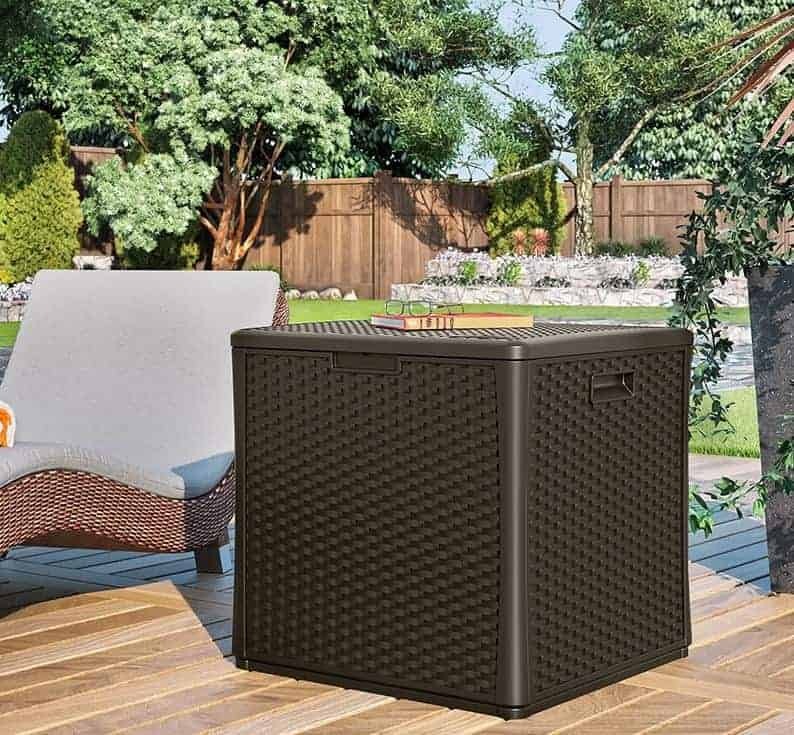 Sometimes you want a classy, elegant and let’s just say a more hidden way to add just a little bit of storage your garden and that is what you are getting with the Suncast Deck Box Storage. 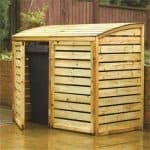 Now of course sitting this in the middle of your decking is perhaps the idea that Suncast had in mind when they came up with this, but actually we feel this could be used for some extra storage anywhere in your garden. It is a decent size offering you good, solid 2 feet 2 inches of height. The floor space (if you want to call it that) of this storage cube is 2.3 X 2.4 so you can easily store a few things inside here. Maybe some outdoor cups and plates, books or whatever you may want. As there is no roof we will talk about the top of the storage cube, or to be exact, the lid. This is made with extra high quality resin and it will shut in such a way that it really does keep the cube water free when it is closed. Which if you have some nice things inside here is just ideal. Suncast really have perfected making things out of blow moulded resin – we have seen them use it a few times and they have never disappointed us with it. This storage cube is actually just as high quality as one of their sheds. Blow moulded resin is resistant to whatever our weather can throw its way and it also has just such a great look to it, allowing Suncast to be playful and add some very interesting finishes to their products. 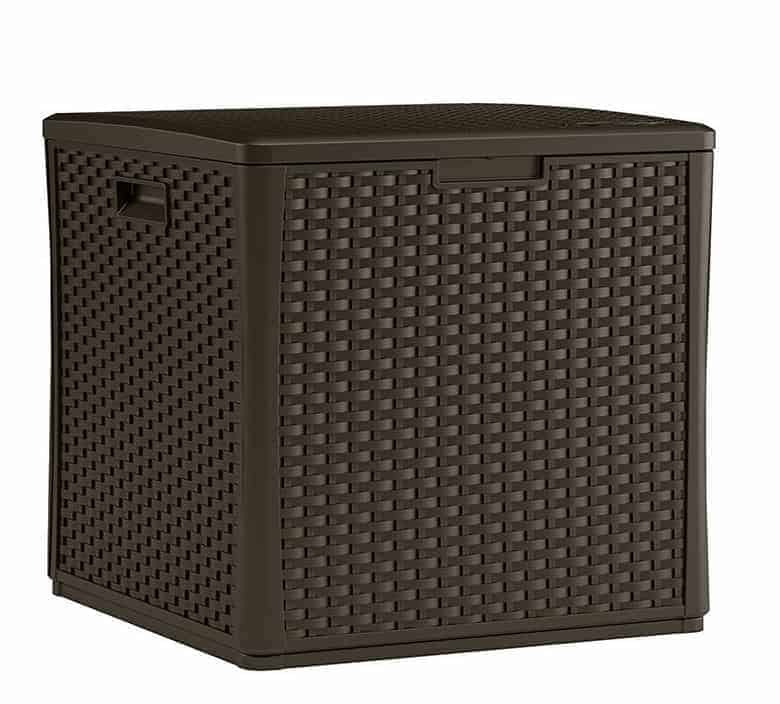 In this case they have given the storage box a somewhat, wicker basket type of look and when you first look at this cube, you will be sure that this is actually a wicker box. It is not until you get up close and touch it that your realise it is not. To ensure a solid storage cube that is going to last for many years and also be able to take the weight of the kids when they sit on it (despite you telling them repeatedly not to! ), Suncast have given this storage cube double walls to make it not only thicker and more durable. So while not a traditional frame, the double walling does act like a frame giving the cube some extra strength. The bottom of the Suncast Deck Box Storage Cube is made from the same blow moulded resin that the rest of the box is. This is water resistant and will be able to take a lot of weight and also not get ruined if you do spill something inside or if you do leave it open and some rain gets inside. One of the things that we love about blow moulded resin is that it is very low maintenance. This is made to be an outdoor box so it will get a bit dirty over the years from the elements and from people no doubt using it as a foot rest. All you will need to do to keep this box in shape is grab a cloth and wipe it down every now and again. 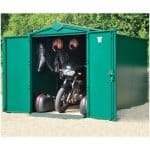 Suncast do offer a fantastic five year warranty with the storage cube and we feel that it is made so well and with such great materials that it is going to last way past the five years they are covering you for. We already touched on the lid up top and talked about how high quality it is, but this lid is also very practical. It is gas assisted so there is no way that you can open the box, grab something and then accidently let it go and have it slam shut. We love this as it not only looks pretty awesome as it slowly rides down, but it also means the box will not be getting broken from the extra abuse slamming the lid down would cause. We are not even sure how a window on a storage box would work so with that being said we are more than glad there is no window or any type of clear panelling on here. This is not the type of box you are going to be keeping your finest wine glasses inside. 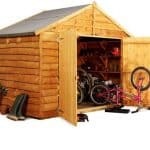 But it does offer a very robust environment to keep things out of the rain and also from the kids footballs or whatever else they may be throwing or kicking around the garden. There is no way to lock the box, but we feel this is a good thing as it is made for quick and easy access. When the Suncast Deck Box Storage Cube has its lid closed there is no way to know what exactly is in here. Also we are sure that many people who see this for the first time will think that it is just a small table or foot rest and have no idea of all the things you have inside. Blow moulded resin is great in so many ways, but there is not really anything you can do in terms of customisation to give the box your own style. You could place something on top to give it a bit of your own little touch, but we feel that it looks great as it is. 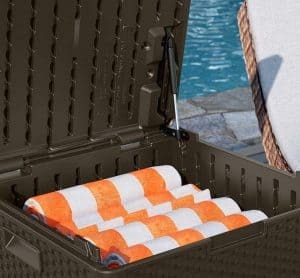 The Suncast Deck Box Storage Cube does not offer any extras which in this case is fine as it helps keep the cost down. This is a great and high quality storage box which we are sure will surprise many people with just how high quality it is. We feel that this box will give you many years of storage and it will do so without you needing to do much in order to maintain it. The Suncast Deck Box Storage Cube offers you a decent amount of extra storage which we are sure will come in handy for many people to keep a few things always on hand in the garden. The hardest part of putting this together is shutting the front door when the delivery man drops it off. This comes already built so there is nothing you need to do. We feel that at just over £100 you are getting a great addition to your garden and for this kind of money it is a good deal. 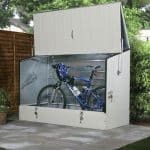 Final Thoughts: No matter if you are going to be buying this to use as storage, or even as just something that will look nice on your decking or in another part of your garden, The Suncast Deck Box Storage Cube will not disappoint. Made with that amazing, blow moulded resin which will last for a lot of years, it does have a very classy look with that wicker basket effect. 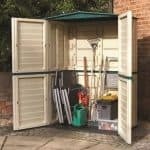 In all we think this could be the ideal way to finish off your garden, all the while giving you a little bit more storage space to help keep your garden organised.